Fiction – paperback; Penguin; 272 pages; 2008. 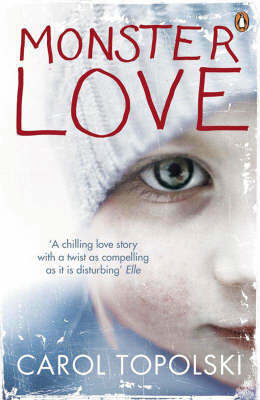 It’s been quite awhile since I’ve read a book as dark and oppressive as Monster Love, by Carol Topolski, which was long-listed for last year’s Orange Prize. In fact, I found myself in a bit of a funk all week, for no good reason, and the only thing I could put it down to was reading this highly disturbing book. It’s almost as if the story within had resonated off the page and enveloped me in a cloud of gloom. I think the most chilling aspect of Monster Love, which tells the story of a married couple accused of killing their four-year-old daughter, is that it could have been lifted from today’s newspaper headlines. It reminded me very much of the the Baby P case (still ongoing), which readers in the UK will know well, and for that reason it seemed a little too authentic for comfort. This realism is helped, in part, by the way in which the story is recounted through a series of testimonies — monologues, letters and official reports — made by people — neighbours, social workers, family members, jurors and prison officer — who have been affected by the crime in some way. The parents, Brendan and Sherilyn Gutteridge, recount their side of the story too, and I am not revealing any crucial plot spoilers by saying that they are perhaps the least realistic of the narrators because they appear so damn weird. Their “perfect love” comprises a strange telepathic connection and, in the latter third of the novel, a series of simultaneous sexual fantasies which stray into sheer kookiness. Still, the author, Carol Topolski, is a practising psychoanalytical psychotherapist, who’s probably treated clients much odder than these two. There’s no doubt that Monster Love is a fascinating, if wholly unpleasant story, but it’s not nearly as thought-provoking as it could have been. This is partly because the narrative is so fragmented that you don’t get a proper overview of the case. You know from the outset that the accused are guilty, so you know what happens in the end, too. And the huge cast of characters all sing from the same hymn sheet so there’s no room for ambiguity or doubt of the couple’s guilt. It also doesn’t help that so many of the testimonies are recounted in the same voice — there seems little to distinguish one character from another. Structurally, this is a poor novel, but in terms of subject matter you will be hard pressed to find anything so startling and dark. The cover alone scares me, its really really ominous especially with that title. Great review. Yes, I grew to hate this cover. I had to make sure I always kept the book face down because I couldn’t stand that eerie little eye staring up at me! There seems little to distinguish one character from another? Having just finished this book, and aware of its brilliance and flaws it must be said that that comment is totally untrue. The characters are very realistic and individual, and the Gutteridges are entirely realistic and nothing like as weird as many a real person must be. But the telepathy veers this novel towards science fiction when it really doesn’t need to bother with it for its amazing punch. Thanks for your comment, Ian. When I said “there seems little to distinguish one character from another” I was talking about their voices only, not their actions or backgrounds. I guess I just felt that the voices of the individual characters weren’t distinctive enough. The book was worth a read, though. Yes, the book is disturbing. But am I the only one to sympathise with sherilyn and brendan ? They never wanted children which is not an excuse for what they did. They should have just given the child for adoption. What I find really strong in the book is the love between them. Yes they are cruel, superficial, materialistic, but the love they have is something unique. They are what you will call soulmates. The telepathy is part of what they are, one soul in two bodies. I feel as if though they should not have been separated. Ever. I don’t say killing their child wasnt tototally wrong. It was beyond belief, but they were too obsessed with each other..for them friends, family and the rest of the world did not exist. They were viewed as monsters because they were different that the accepted. You might not understand my viewpoint, but for me the central theme was the connection between brendan and sherilyn, their daughter’s story came as a background.